Good News for Xiaomi Users, The flagship Xiaomi Redmi 6 go on sale for the first time and will be made available to buy via Flipkart and Mi.com. Xiaomi’s Redmi 6 was launched in China back in June, Now It will be available to purchase in India today, at 12 pm. This series of the smartphone was launched last week alongside the Redmi 6 Pro and 6A, which will first go on sale this Thursday and on September 19. When it comes to budget-friendly phones Xiaomi is the first brand hit in everyone’s mind. Now Here is Redmi 6 is among the most affordable smartphones. The Xiaomi Redmi 6 Comes with a 5.45-inch HD+ (720×1440 pixels) with an 18:9 aspect ratio and an 80.7 percent screen-to-body ratio, runs MIUI 9.6 on top of Android 8.1 Oreo out-of-the-box. The Xiaomi Redmi 6 is powered by the octa-core MediaTek Helio P22 SoC, coupled with 3GBGB of RAM and 32GB and 64GB storage variants. Moreover, the Storage is expandable via microSD card (up to 256GB) via a dedicated slot. In terms of optics, The Xiaomi Redmi 6 offers dual camera (horizontally stacked pair) with a 12-megapixel primary sensor and a 5-megapixel secondary sensor, coupled with f/2.2 aperture, 1.25-micron pixels, and Portrait Mode. For selfies, the phone gets a 5-megapixel camera with f/2.2 aperture, 1.12-micron pixels, and certain AI beautification capabilities. Connectivity options include, 4G VoLTE, Wi-Fi 802.11 b/g/n, Bluetooth v4.2, GPS/ A-GPS, GLONASS, Micro-USB, and a 3.5mm headphone jack. 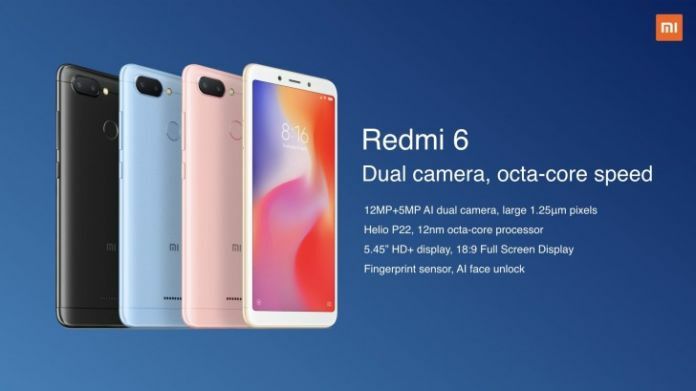 Also, The Xiaomi Redmi 6 comes with a fingerprint sensor, accelerometer, ambient light sensor, electronic compass, gyroscope, infrared, and proximity sensor. There is a 3,000mAh battery under the hood, with support for 5W charging. The smartphone measures 147.5×71.5×8.3mm and weigh 146 grams. The phone will available in four colour option, Black, Gold, Rose Gold and Blue colour options.